Brahmatal provides panoramic view of the Himalayas with Mt. Trishul and Nanda Ghunti, bird’s eye view of the majestic Roopkund Lake and ample opportunities to capture the majestic snow covered peak with their camera. For avid nature photographers, Brahmatal offers lot of opportunities to capture nature at its best. 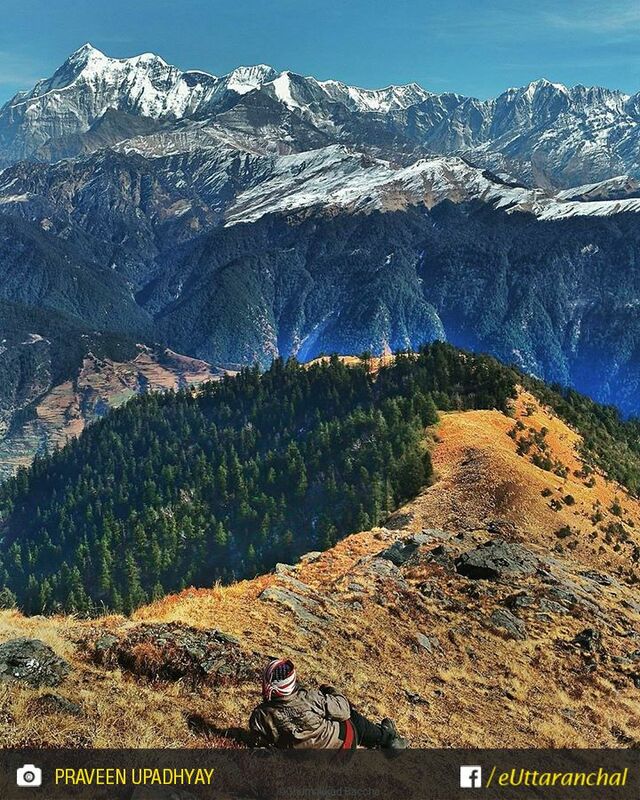 The Brahmatal trek takes one through beautiful valleys, hushed hamlets, streams, and conifers and oak forests. In winter, the region is covered in sheath of snow and offered unparallel Himalayan view. Pickup will be from Kathgodam Railway Station and then drive to Lohajung. The drive is a long one but the beautiful views of the hills and rivers should be rewarding enough. From Lohajung we start our trek towards Bekaltal via Mandoli village. The trek takes around 4 hours and will pass through the rhodenderon and oak trees. Overnight stay will be at tents. Post breakfast, we start our trek towards Brahmatal which takes us through the enchanting lush green forests and beautiful meadows. Brahmatal lake is situated at an altitude of 3,400 m. Overnight stay will be at tents. Today we summit Brahmatal peak which will provide you with one of the most scintillating view of the Himalayas especially Trishul and Nandaghunti peaks. Daldum which will our campsite is just 3 hours from the peak. Overnight stay will be at tents. After having breakfast, we trek back to Lohajung from Daldum. Lohajung is only 3.5 kms from Daldum on our way down. This is the last day of the tour. We drive back to Kathgodam where you can avail bus or train to reach back home. The trek to Brahmatal is an easy to moderate one; however if you are inexperienced, it is better to train your body for the trek at least a month before. It is advisable to have an experienced tour guide to accompany you on your trek. It is advisable to avoid trekking in the monsoons season as the trekking route tend to be slippery and the region could be prone to unexpected landslides and road blocks. When amidst the mountains, travel in a group of two or more. Venturing out alone can be unpredictable and risky. Also, make sure you have informed someone about your plan back home. The trekking route to Brahma taal involves easy during summer and medium to traverse during winter. Brahmatal is a trekking destination rather than a tourist destination. No road leads to Brahmatal, only determination and will. Camping in tents is the only viable accommodation option at Bharmatal. One can carry his own tent or rent it from any tour operator before starting the trek. Please make sure you have made sufficient arrangement for sleeping bags and mattresses as well. The only food you can gorge over is the one you take with yourself. If you are trekking with a group, it is advisable to find a local cook to travel with you so he can prepare meal for you wherever you decide to camp for thenight. It is advisable to carry some packaged food with you for snacking on the route. Don’t forget to carry your personal utensils. According to the Hindu mythology, the prepossessing Brahmatal is the place where the creator, Lord Brahma did a serious penance. It is said that Brahma Ji meditated here for several years. Hence, the place got its name from it. By Road: Kathgodam is well connected with major northern cities via motorable roads. There are various bus services available from Delhi to Kathgodam. One can opt for semi-deluxe, deluxe and AC Volvo as per their needs. In addition to that, Kathgodam is connected with Delhi by Uttaranchal State Road Transport Corporation buses on a regular basis from Anand Vihar ISBT. By Rail: The nearest railhead is Kathgodam Railway Station. There are numerous trains connecting Kathgodam with other major cities like Delhi, Lucknow and Kolkata etc. The frequency of trains to Kathgodam is quite high as it is the gateway to the Kumaon region of Uttarakhand. By Air: The nearest airport is the Pant Nagar airport which lies approximately 34 km from Kathgodam, and offers daily connectivity with New Delhi. What is Brahmatal famous for? Brahmatal is famous among tourist as Trekking. Brahmatal is recommended destination for Foreigners, Groups. Brahmatal is popular destination for following activities/ interests - Adventure, Lakes, Trekking, Winter Treks. Travelling to Brahmatal in 2019? Contact us for planning your Brahmatal tour with best travel packages of as per your requirements!